Bed & Birding - Homes made for Birders! Dear Fellow Birders, Dear Partners, Dear Hosts, Visitors and Guests! 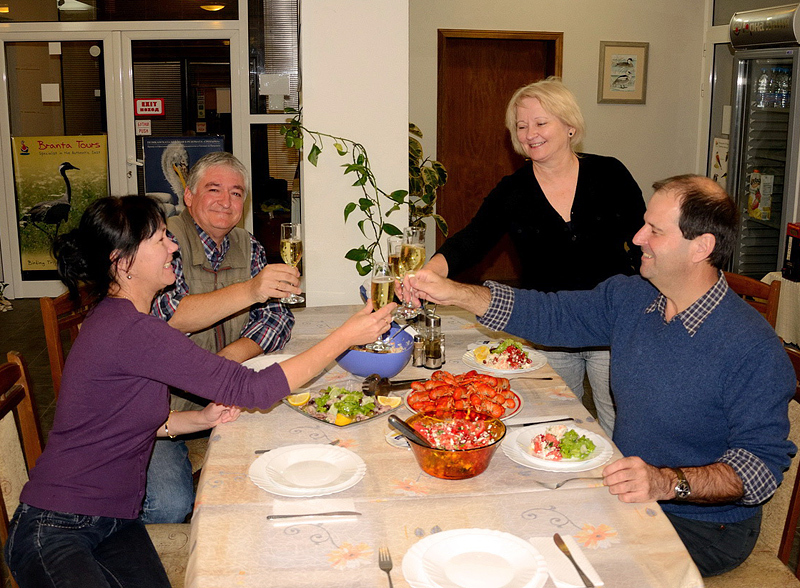 General meeting of the Bed & Birding shareholders held at Branta Birding Lodge in October 2013. From left to right: Tatyana Simeonova, Pavel Simeonov, Natasha Goriup and Paul Goriup. We are delighted to bring to your attention the creation of our blog, in which we would like to share information related to Bed & Birding network. The following is a brief outline statement concerning this new concept in bird-tour management, accommodation and promotion. During 2013 we commenced work on the design of a marketing strategy, developing a franchise centred on a common theme of standards and services relevant to accommodating the needs of holidaying/travelling birders...rather than one (such as that of a fast-food chain outlet) where all hotels or lodges would have to conform to the same outward appearance. We first decided to strengthen out ties with tour companies already associated with birdwatching, for example Salix Tours in Ukraine, Branta Tours in Bulgaria or Great Glen Wildlife in Scotland, that continually seek top birding/wildlife locations together with appropriately suitable and well-placed accommodation. We have already registered a franchising company and possess a trade mark and a logo of European brand for "Bed & Birding - Homes made for Birders!" Our online facility aims to connect people of varying ability, or levels of interest, who share common bird-oriented interests. In this respect there should be mutual advantage by way of advancement of birding experience, including improvements in identification skills, plus convenient access to information concerning the best birding locations and neighbouring appropriate accommodations. A significant advantage of the network to travelling birders is the ease by which prompt selection of right location for their birding holidays is achieved, because choice of an appropriate Bed & Birding establishment guarantees the most convenient and dedicated accommodation. The Bed and Birding concept was conceived at Branta Birding Lodge (www.birdinglodge.com), which has already been joined by several well-located franchise partners - from Greece, Bulgaria, Romania, Ukraine, Belarus, Finland, United Kingdom and Peru. Collectively they embrace already diverse internationally important wildlife areas including the major coastal wetlands within the Black Sea region and Danube Delta, as well picturesque alpine reliefs and low-level Mediterranean plateaus, bogs, lakes, rivers and different kind of forests that range from typical Southern Taiga forest to pristine Amazon rainforest. We are very pleased to announce that similar establishments in Europe, Asia, Africa and South America are also considering membership of the Bed & Birding network. We are, however, seeking to significantly increase the number of partners that would embrace our philosophy and quality criteria. Accordingly we would greatly appreciate if you, as a potential partner, would also consider becoming one of our founder members. We would be delighted then to send further detailed information regarding your Bed & Birding partnership, followed by an info pack and partner's contract. We are completely open to receiving any suggestions intended to help improve and develop the Bed & Birding concept, and welcome your input at every level. What follows in our website is an attempt to express some of what you will really experience if you join Bed & Birding network - the only place on Earth where you will find Homes made for Birders!